This post describes how to bring up an existing image viewer app (the "gallery-after" app from the github repo for Railscasts episode # 381), then add fancybox support to it. First order of business: We need a Rails app that displays images so we can fancybox it up! Rather than create one from scratch, let's grab an existing app. Note that the app depends on rmagick, and rmagick depends on ImageMagick. On Linux distributions, ImageMagick will more than likely be available in your package management system. This is the point where you'd normally do nothing more than type bundle, and the app would be usable in short order. "An error occurred while installing rmagick (2.13.1), and Bundler cannot continue." ...and the installation of rmagick should succeed. Side note: Near as I could tell, the rmagick problem is due to an incompatibility between rmagick 2.13.1 and the latest version of ImageMagick available via homebrew. And the gallery-after/Gemfile.lock comes configured to install rmagick version 2.13.1, leading to the problem. 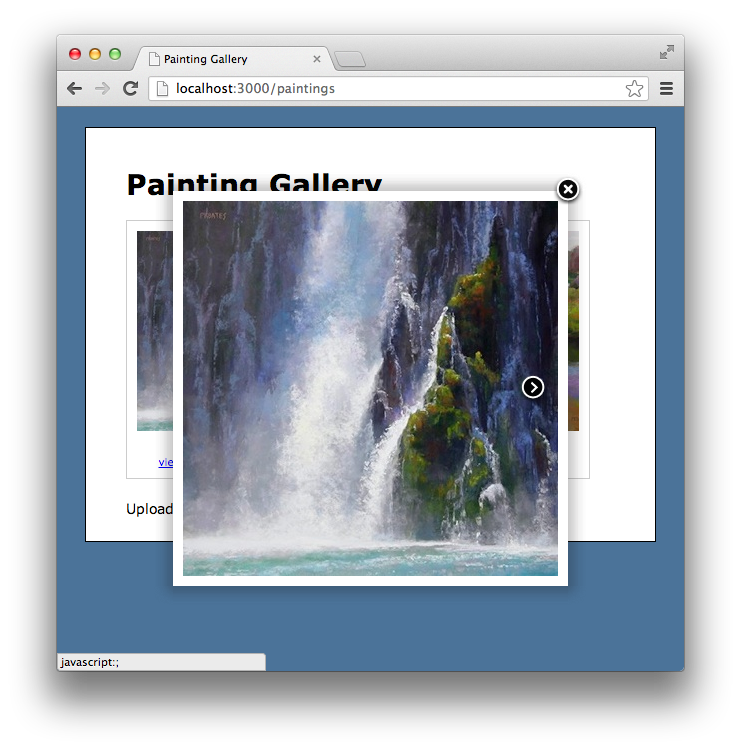 Point a browser at localhost:3000 and drag-and-drop some image files into your browser window. This will insert the images into your DB, which will come in handy later so we have something to view in fancybox. Next, take care of the fancybox CSS file. The last step is to add a gallery link to the paintings partial, where the link's class attribute value is set to the "grouped_elements" identifier we added to paintings.js.coffee. Also, the gallery link's rel attribute value needs to be defined; in fancybox elements with the same rel value are considered part of the same gallery, which enables flipping between the images without having to close the fancybox viewer. When you restart your Rails app, each image the app displays should now have a "view in gallery" link below it that launches fancybox, with navigation controls to skip from image to image! Not too shabby for just a handful of extra lines of code.